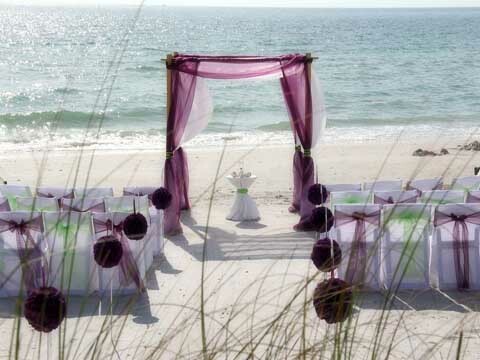 Florida Beach Wedding Themes to inspire! 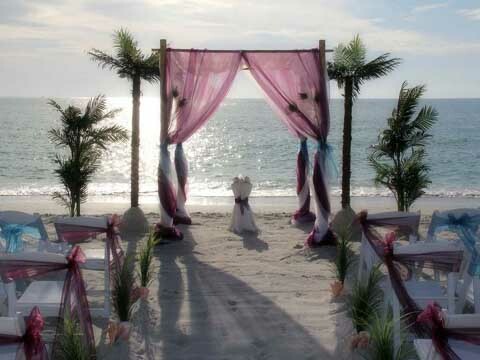 Florida beach wedding themes can span the spectrum of colors with many variations; the arch, the aisle, the accents. 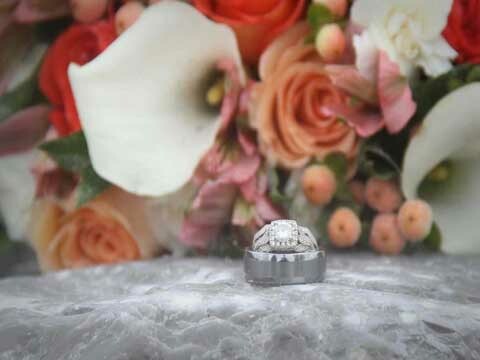 We at Suncoast Weddings have gathered some of our favorite themes and created galleries designed to inspire and tempt you. Do you like bold, vibrant looks or something more subtle? 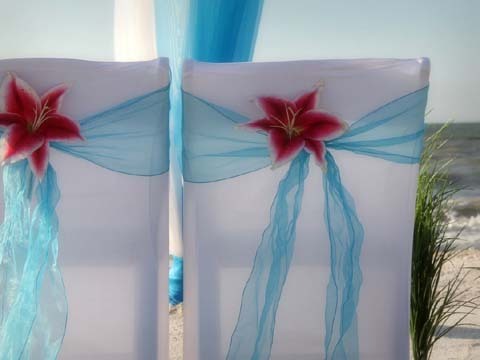 For a collection of ideas around custom designed themes, check out our beautifully coordinated wedding components - from aisles, to arches, to chairs, bouquets - pick up some style hints and see which colors and styles you prefer...We will tailor your service to your requests - this is your chance to choose classic ivory or inject a hint of color. 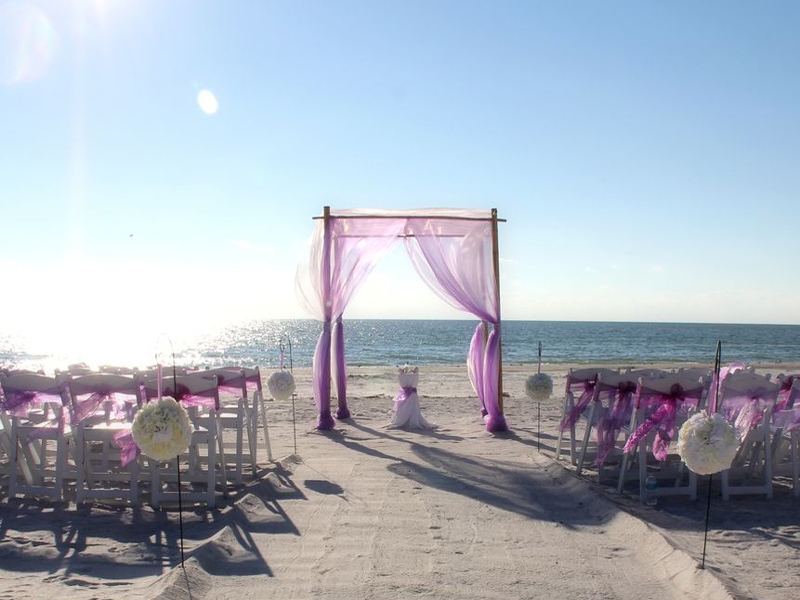 Your service will truly be as unique as you are and with Suncoast Weddings attention to detail, get ready to enjoy your perfect day on a Florida beach. 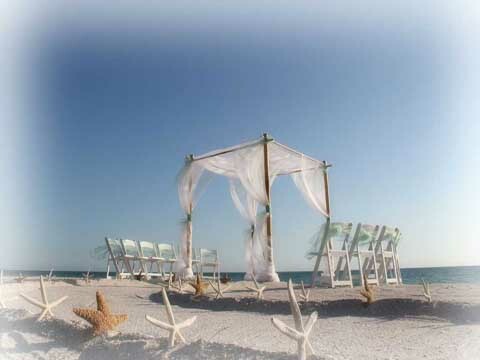 Florida beach wedding themes can be fun, edgy, classic, stylish, reserved, elegant, unique, beautiful, colorful, eclectic, personal ... and always special, each Suncoast Weddings service will be uniquely yours. A moment in time when the stars align, yours and yours alone. Ever popular – lilac, plum, eggplant, purple and lavender are pretty and distinct – the sashes take on a richer look layered over crisp, white chair covers. 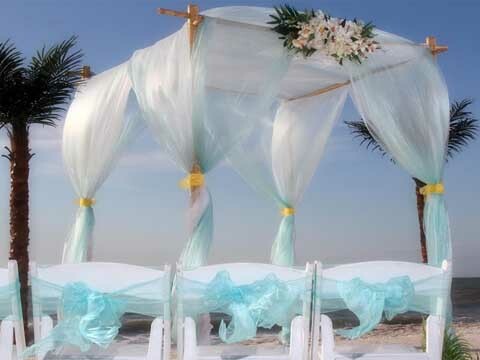 Choose between sheer drapes or bold colors – this range of colors are versatile and delightful. Pink Perfection. From hot pink to softer blush tones, check out this gallery to get some great ideas. We especially love the conch shells along the aisle with the blush chiffon on the arch… . 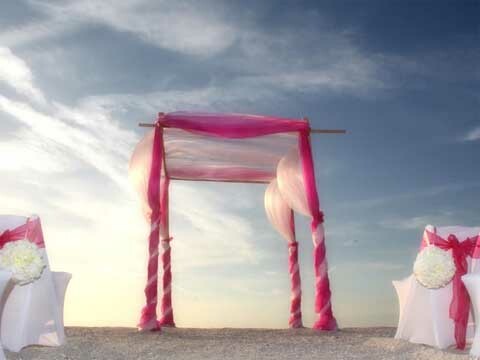 for wedding day style perfection … think Pink! If subtle and romantic is more your style, let these next looks be your inspiration. From tones of blush and aqua, to buttercup yellows and lovely lavender., mix and match or choose a theme, the choice is yours. 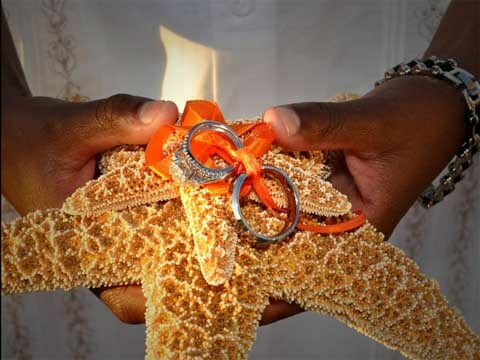 Starfish – The perfect Florida beach wedding style statement. 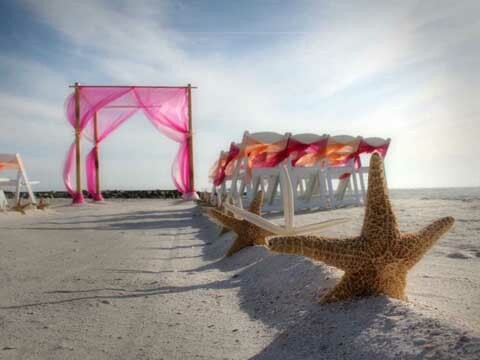 From aisle markers to cake toppers, to centerpieces, to tikis … a little planning goes a long way and if you choose to make starfish part of your day’s theme – we have some great ideas for you. Florida delights with dazzling blue skies and azure surf. Blues come in so many shades that we called our gallery ‘a symphony in blue’. All one shade or contrasting hues – blue proves a popular choice and always delivers. Stargazer lilies … colorful, evocative and exotic, bringing a heady aroma and vibrant petals. In your bouquet or decorating your ceremony site, stargazer lilies are versatile and distinctive, blending with similiar colors or totally new shades. Feeling bold? For striking looks and more than a hint of drama, check out our ‘vibrant and bold’ gallery. Easy to coordinate with, with so many options. Make a backdrop to stun with color, texture and style. Enchanting orchids .. delicate, colorful, intricate and beautiful. Decadent but worth it! 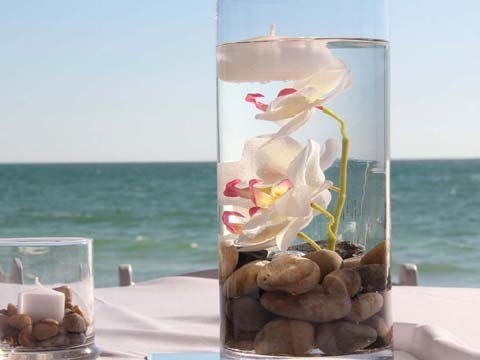 Orchids brings elegance and class to your bouquet, your arch, your centerpieces at your reception. Fall under their spell on your big day. 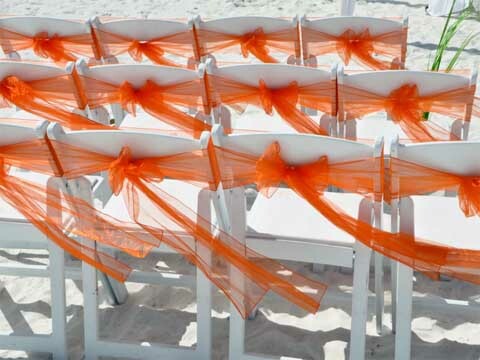 It’s hard to fathom why tangerine and shades of orange look so great at a beach wedding – they just do! Maybe it is the contrast with the blues of the sky and the sea, maybe it is the bright, citrus happiness it brings to the setting. 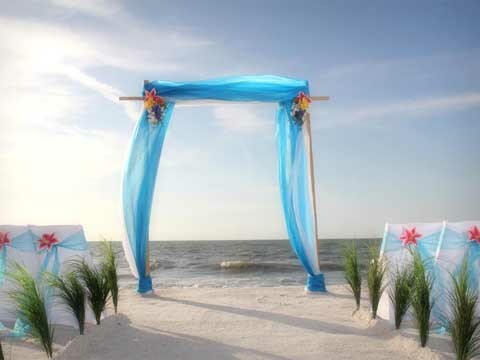 There are so many more ways to weave flowers into your beach wedding. 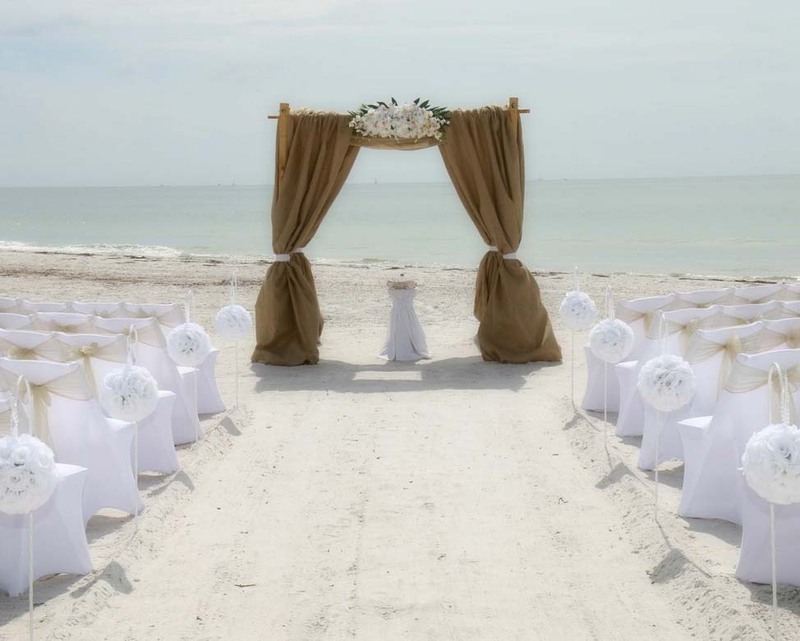 From hair accessories, to leis, to flowers decorating the arch, the chairs, the tikis, the unity table … check out this gallery for fresh, fragrant, floral inspiration! 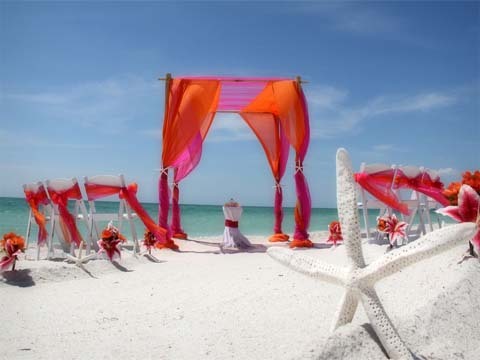 Seashells … beautiful, intricate, colorful and delicate, they look beautiful in bouquets and are a Florida beach wedding themed dream! 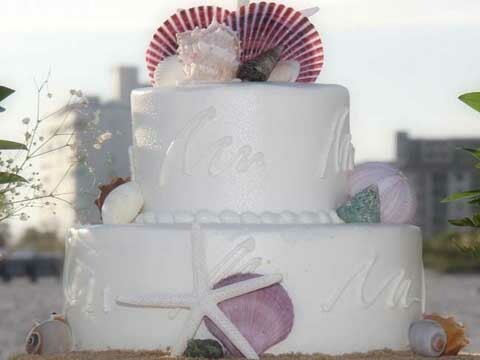 Let the shoreline inspire you and make seashells a feature on your big day! This is a relatively new trend we are seeing – but we like it! Peacock feathers and rich jewel tones are simply stunning. 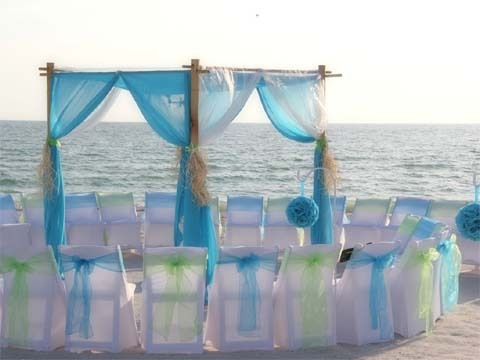 For a beach wedding with a twist, we love blending these colors and you can let your imagination run wild. Sunshine and a pop of brightness enrich and delight when sunflowers are a theme. Bright and dramatic, they provide a warmth and style uniquely happy. 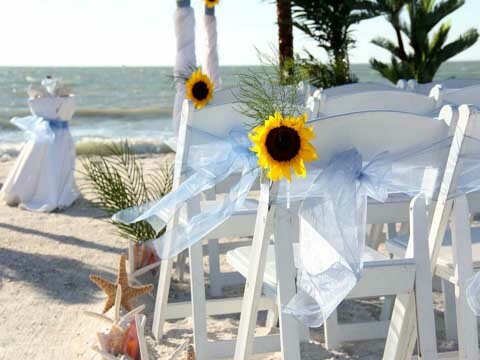 From the chairs, to tikis, to the arch to your bouquet, sunflowers are versatile and beautiful!